These are my favorite small cities in California. Here’s why you’ll love them, too. 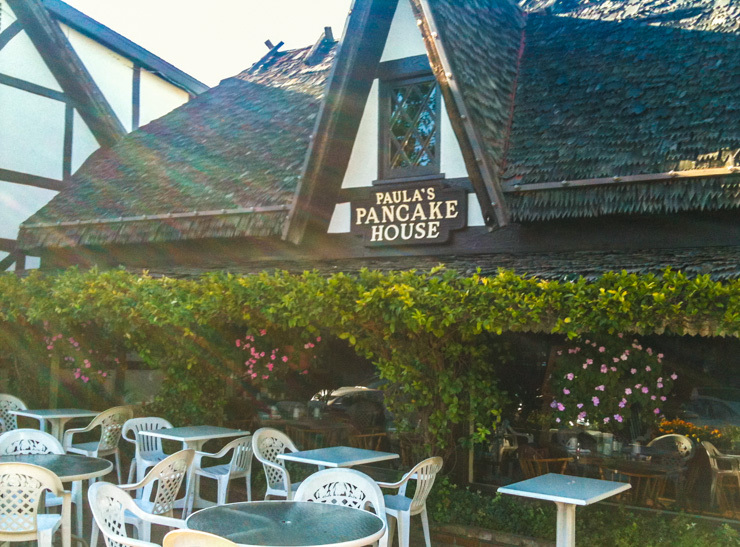 The patio of the restaurant that is home to my favorite sandwich in California (in one of my favorite cities). Read on to find out which city to find it in. Spending over a decade living in San Diego means I’ve gotten to visit a large majority of California. 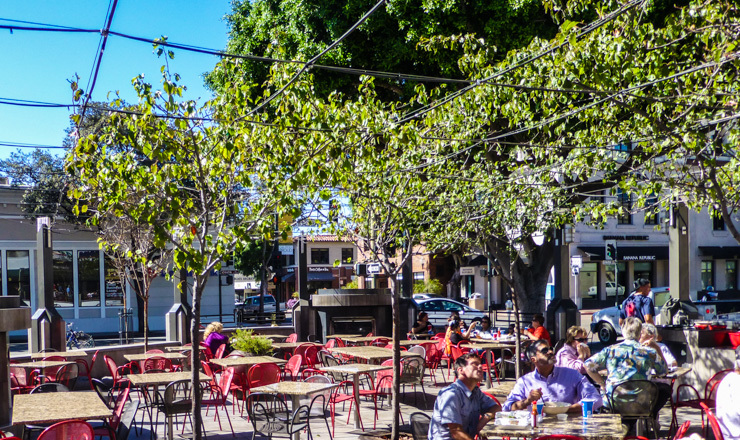 While the big cities like San Diego, LA, and San Francisco have their appeal, I’ve often found that the unique laid-back charm of California comes out the most in the state’s small cities. The ones on this list have a population of less than 70,000, with most under 30,000. I’ve had the chance to travel multiple times to these California cities (listed out south to north) and they are part of the reason California will always have my heart. 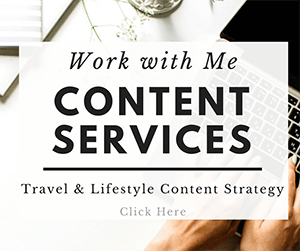 Here’s why they’ll capture your heart, too, plus the top things to see, do, eat, drink, and where to sleep for each city. Encinitas is my favorite suburb in San Diego, mostly because it doesn’t feel like a suburb. Instead, it has a chill beach vibe that just happens to sprawl slightly east of the 5 Freeway into residential neighborhoods. The downtown area has a main street along the Coast Highway 101 that is flanked on either side by bars, restaurants, and funky boutique shops. The city is laid-back and manages to offer a diverse range of businesses that still somehow feel cohesive. 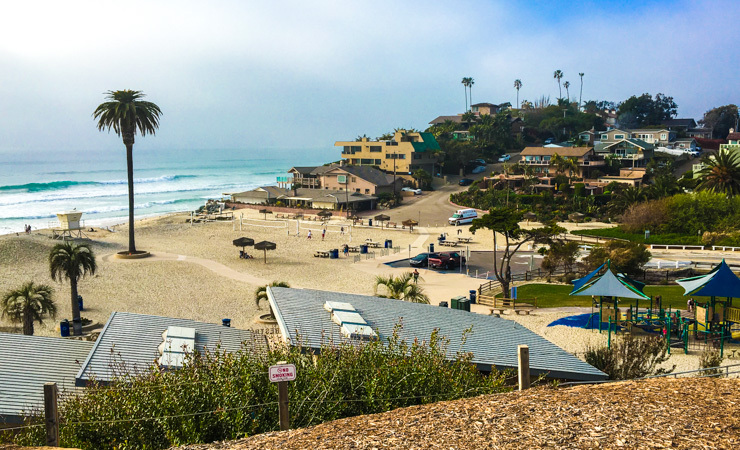 Hipsters, surfers, and families all will feel welcome and at home in Encinitas. 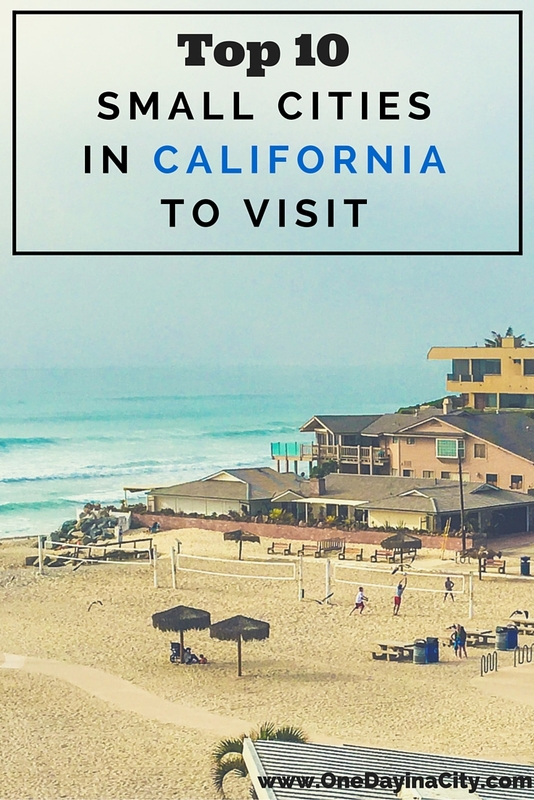 On its western border are miles of some of the best beaches in San Diego County, and it has a convenient San Diego Coaster stop for access to both the beach and downtown Encinitas. Where to Eat: This is so hard! I’d have to say Encinitas Fish House, though. I love its fish tacos, which you can custom order the type of fish and sauce you want, and the laid-back open air patio lets the salty air sift in while providing some shade from the sun. Other good options: Juanita’s Taco Shop, Union Kitchen + Tap, Trattoria I Trulli, and Priority Public House. Where to Drink: Encinitas Ale House for the huge selection of craft beers and the Bier Garden Encinitas for delectable Bloody Marys, both located off of the Coast Highway. Where to Sleep: The Inn at Moonlight Beach is an ideally located B&B. To see pictures and prices for the Inn at Moonlight Beach, click here. Insider Tip: Moonlight Beach at the north end of Encinitas is one of the few beaches in San Diego that has bonfire pits. They are first come, first serve so get there early to claim one. Also, drive or walk down Third Street to see the boat houses. Don’t Forget to Pack: Flip-flops and a rashguard so you can be more comfortable while you catch some waves either boogie boarding or surfing. These are some of my favorite flip-flops. Orange County can feel overwhelming due to its ritzy reputation and plethora of beachgoers. Laguna Beach definitely fits that description, but I don’t mind braving the parking headache to visit it. This small California city has a dynamic art scene with a wide range of different kinds of exhibits you can view at the galleries, many of which are located within walking distance of each other in the coastal Laguna Beach Village. I love the sea so I always have to make time to visit the Wyland gallery when I’m there. Laguna Beach’s village stretches from the beach for a couple miles and I generally find that if you’re up for walking and you keep heading east, you can escape a large majority of the crowds. The streets are pretty and nice to walk along and you can take breaks to tuck into art galleries you stumble upon. I still make time for the beach while in Laguna Beach, though, because its stretch of coastline is gorgeous. 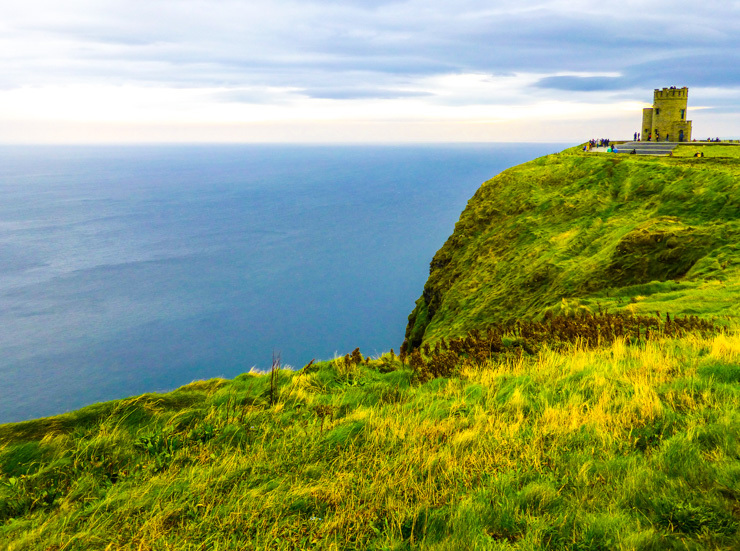 Top Attraction: The oceanviews and the art galleries. Where to Eat: Nick’s Laguna Beach for seafood or the Cliff Restaurant with its sweeping ocean views for upscale romance. Where to Sleep: Montage Laguna Beach has a gorgeous pool that’s only overshadowed by the gorgeous ocean views just beside it. To see pictures and prices for Montage Laguna Beach, click here. Insider Tip: Need a short respite from the sun or the crowds? The public library is located on Glenneyre Street and has a gorgeous view of the ocean. What to Pack: A book to read on the beach. A recent favorite of mine is Big Little Lies. There’s a reason all those rich movie stars live in Malibu…it’s pretty awesome. The coast is gorgeous and has tall rocks and ridges and cliffs sticking out of and next to the ocean. 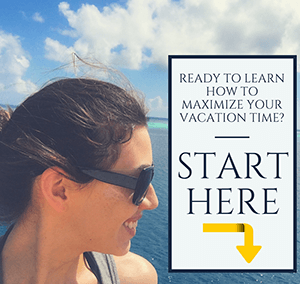 Since this is Malibu, you can take your pick from a variety of 5-star restaurants situated right on the cliff overlooking the glistening waves. When you first get into Malibu, drive by the beachfront mansions and daydream about living in them. Malibu also has a cute shopping district called Malibu Country Mart. 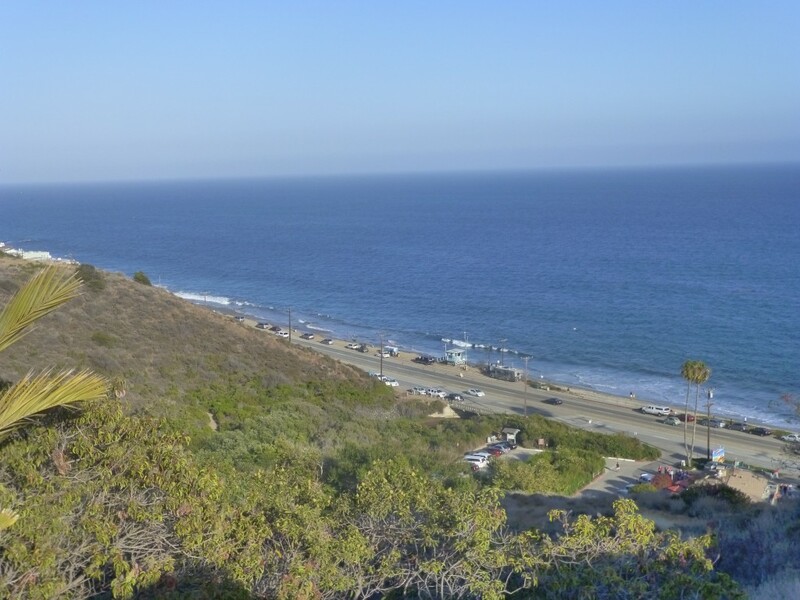 Outdoor enthusiasts will enjoy the close proximity to the Santa Monica Mountains with a myriad of hiking trails. Malibu is also home to some vineyards and several wineries. Top Attraction: The beaches. Check out gorgeous El Matador State Beach for a good place to watch the sunset. Where to Eat: Nobu or Geoffrey’s Malibu for clifftop dining. Ollie’s Duck and Dive for a more affordable, gastropub option in town. Duke’s Malibu for a laidback beach vibe. Where to Sleep: The luxurious Malibu Beach Inn is located right on the coast. For prices and pictures of Malibu Beach Inn, click here. Insider Tip: Beat the high costs of Malibu hotels and camp instead. I had a memorable night camping in Malibu at Malibu Beach RV Park. What to Pack: Your favorite swimsuit and a nice outfit if you’re splurging on dinner. My favorite thing to do after a day of snowboarding at Snow Summit ski resort is to get a drink and bite to eat in the tiny city of Big Bear Lake. In fact, I had to double check this really was a city, because it has such a remote mountain town feel to it with its wooden lodges and rustic waterfront by the lake. But it’s actually not that remote; Big Bear Lake is also why people who live in southern California like to boast they can spend the morning in the snow and the afternoon lounging by the beach in the warm sun since Big Bear Lake is only 145 miles from San Diego and 97 miles from Los Angeles. Top Attraction: The Lake and the Mountain, i.e. kayaking, standup paddle boarding, or boating on the lake and snowboarding or skiing on the mountain (Big Bear helped to put snowboarding on the map so if you’ve never tried it before, this is the place to do so. Snow Summit even has its own terrain park at Bear Mountain, which is included in Snow Summit’s lift ticket. Where to Eat: The Captain’s Anchorage for steak and chowder and other comfort food in a lodge-type setting. Where to Drink: Preferably in a hot tub with views of the lake. Ok, ok, if that isn’t an option, head to Club Bombay for some well crafted cocktails. 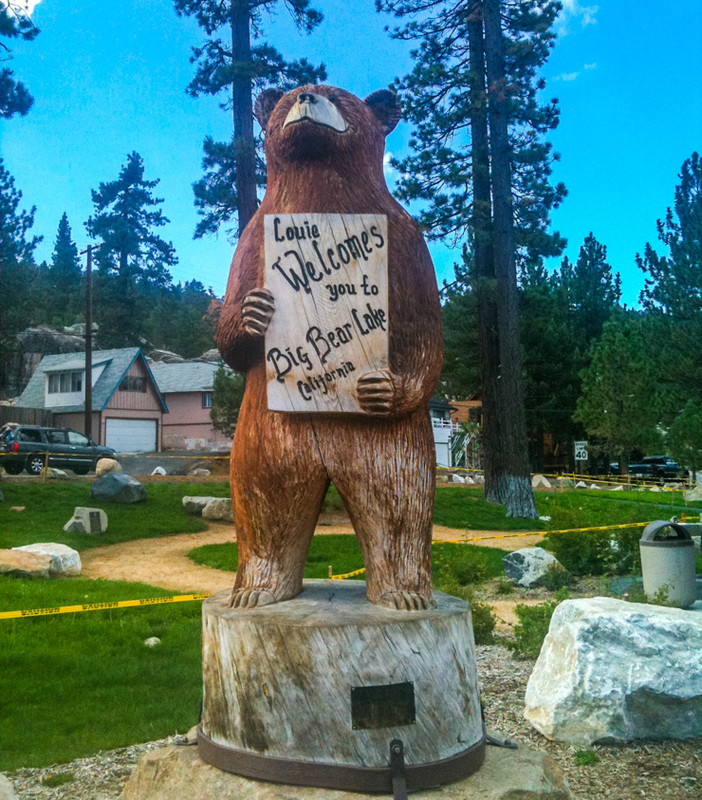 Where to Sleep: In the summer, camping is my favorite way to spend the night in Big Bear Lake. Check out Pineknot campsite. In the winter, Cathy’s Cottages is a budget-friendly, cozy option. Click here for pictures and prices for Cathy’s Cottages. Insider Tip: If hitting the slopes and you don’t have your own skis or snowboard, rent your equipment in downtown Big Bear Lake or at a rental shop in San Diego or LA the night before – you’ll save lots of time not having to wait in the long rental line at the ski resort. What to Pack: Lightweight winter gear if skiing or snowboarding. There may be snow on the ground, but often a lot of it is manmade and the days can still get warm. And don’t forget goggles or sports sunglasses. You’ll want the latter in summer, too, when paddling around the lake. I like this and this for snowboarding in Big Bear. 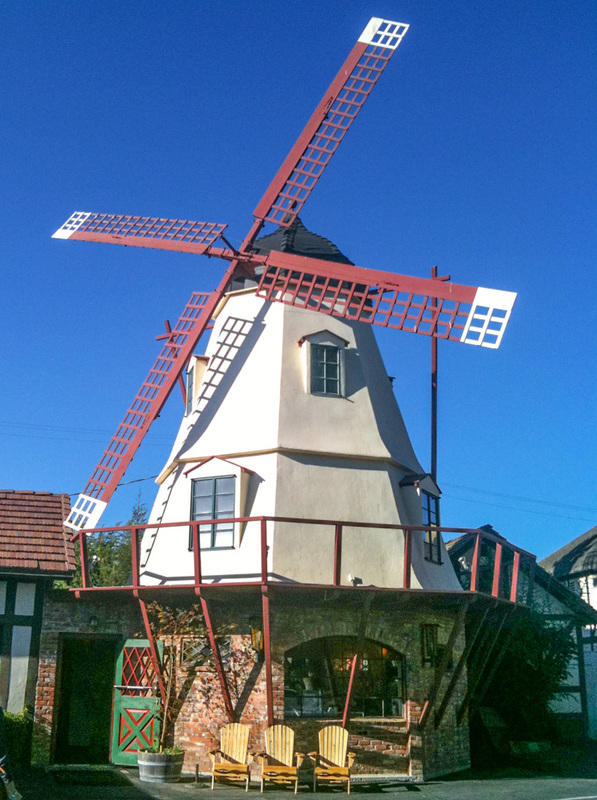 A Danish-inspired windmill in Solvang. Solvang is adorable. It’s a modeled after a traditional Danish town complete with windmills and buildings adorned with geometrical beam designs and sloping roofs. Ok, I suppose it’s also a bit kitschy because of this, but it can carry it off. I think the more you get into the Danish spirit, the more fun it is to visit Solvang. Solvang’s little Danish-inspired village is a great city to walk around with cute shops galore, many of which carry European imports. I love Hanson’s Clock Shop for its cuckoo clock collection. For wine tasting, there are many options ranging from places that pour different local wineries to smaller tasting rooms for a specific winery. Top Attraction: The Danish architecture – walk around to get a close-up look at it. Where to Eat: Root 246 is the top restaurant in town for a high-end experience, and the gourmet menu uses local ingredients. Head to Bit O’ Denmark for some Danish cuisine. Paula’s Pancake House has some seriously awesome pancakes and is my top pick for breakfast, though be prepared for a wait if you’re not up early. Where to Drink: Lucas and Lewellen is my favorite tasting room in Solvang because I love their wine. I also enjoy getting a glass of Pinot Noir in cozy Wandering Dog Wine Bar in the evenings. If you’re wined out, the Solvang Brewing Company has a European city pub feel to it with a myriad of drafts to choose from. Where to Sleep: Hadsten House has Danish charm. To see pictures and prices for Hadsten House, click here. Insider Tip: About two and a half miles south of the village you’ll pass El Rancho MarketPlace off of Mission Drive. This is my favorite grocery store of all time. It has a wonderful wine section with a bevy of local wines, but where it really stands out is its deli meat counter where you can get deliciously hearty sandwiches that they’ll wrap up for you and which you can take to a nearby winery for a picnic lunch. Don’t Forget to Pack: A picnic basket that has its priorities straight: lots of room for wine. How fun is this picnic basket?! Morry Bay has a vibe more reminiscent of an old fishing village than a small city located just a couple hours from the huge metropolis of Los Angeles. 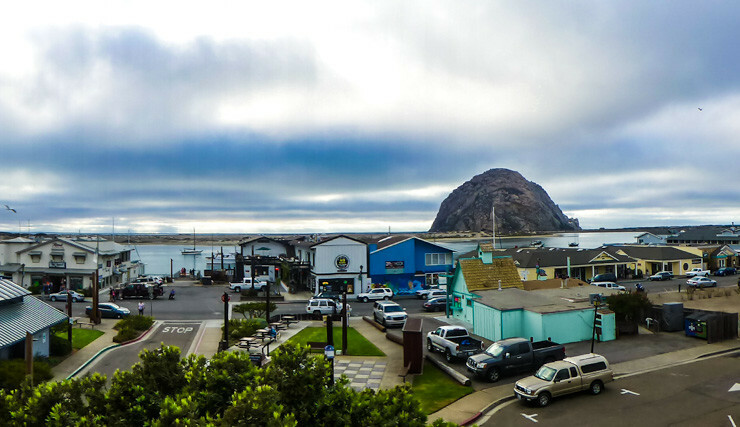 Morro Bay is the only city on this list that I’ve only been to once, but it stands out in my memory strongly enough to make this list. 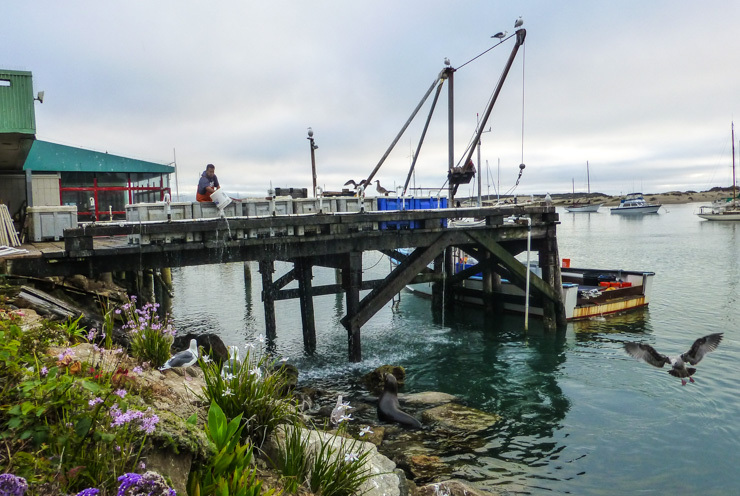 Morro Bay has a small harbor where local fishermen depart and return to each day. When I was there, my husband and I watched as one crew cleaned fish in the buckets lining the main pier while seals splashed below hoping to glean some droppings. The city is often enveloped in a hazy marine layer, which gives it a different vibe from other seaside destinations along California’s sunny coast. The harbor is lined by unassuming seafood restaurants, some of which are built on top of piers, plus small shops. Beyond the harbor, Morro Rock ruggedly juts up into the skyline. Seals waiting for a bite to eat from local fishermen in Morro Bay. Top Attraction: Morro Rock, which is located at the end of a small causeway connecting it to the mainland and has a convenient parking lot. You can walk around Morro Rock to get a closer view of the rock plus pretty views of the ocean bay. Where to Eat: The Galley — Harbor views, fresh seafood prepared well, and a super friendly staff. Where to Drink: Bella Vino’s on Market Avenue by the harbor, which has local wines and a picture window showcasing Morro Rock. In the morning, head to Rock Espresso Bar on Morro Bay Boulevard for an excellent latte. Where to Sleep: We stayed at Sea Air Inn, which was convenient to the harbor and had clean rooms with a continental breakfast and was budget friendly. Morro Bay seems to be all about the motels, but if you want to splurge a bit, try Embarcadero Inn and Suites. Click here for Sea Air Inn prices and pictures. Click here for Embarcadero Inn and Suites prices and pictures. Insider Tip: There are only a few fine dining seafood restaurants located directly on the harbor so make a reservation in advance to ensure you get a table. Don’t Forget to Pack: A light jacket or cardigan for at night. The coastal breezes can get a bit chilly once the sun goes down. …And one more seal picture from Morro Bay that I love! San Luis Obispo is a college town that just happens to also be known as the Happiest Place in America. My college days were pretty happy, but San Luis Obispo has more going for it than just a highly-rated university. Perhaps the happiness level is tied into its nickname, SLO, because you do feel like you can slow down in this little central California city. It is far enough from the beach that it doesn’t get the sand-seeking crowds, yet no so inland that you feel like you’re in the desert. SLO is surrounded by vineyards and wineries with tasting rooms and is home to Laetitia Winery, which makes one of my favorite Pinot Noirs. In the city center, you’ll find several blocks of shops with one edge comprising of a meandering creek. Some of the best dining in town is located along the creek. On paper, there really isn’t anything about San Luis Obispo that sets it apart from any other wine town, but there is a level of peacefulness in the atmosphere that is hard to find in a city and it draws me in every time I visit, making it one of my favorite places in California. Top Attraction: The shops and eateries of the downtown area. And Firestone Grill — see below. Where to Eat: Firestone Grill, which has the best tri-tip sandwich ever and the patio pictured at the top of this blog post. Novo Restaurant and Lounge is another good choice with scenic creekside dining and a local wine list. 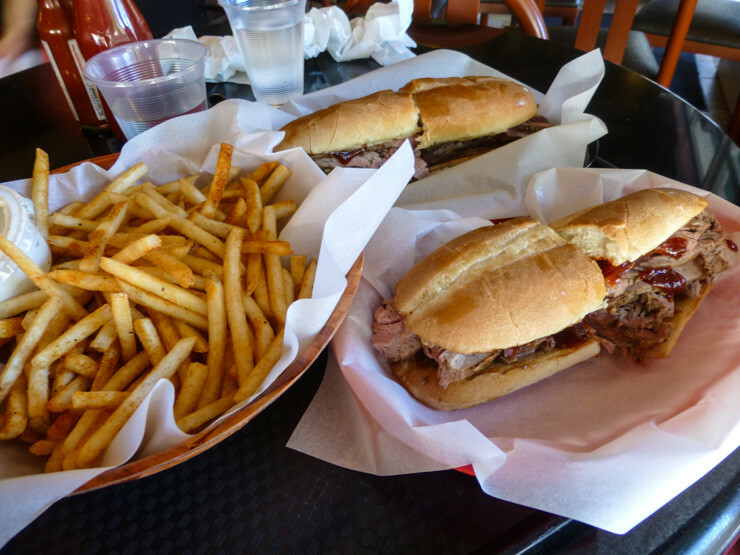 Firestone: Home to what very well may be the best tri-tip sandwich IN THE WORLD, located in San Luis Obispo. The fries are also pretty awesome. Where to Sleep: Madonna Inn – funky and eclectic with theme rooms and a pink onsite restaurant. Heritage Inn is also a sweet little B&B located a bit closer to the center of town. To see pictures and prices for Madonna Inn, click here. Insider Tip: Take a bathroom break in the men’s restroom at Madonna Inn to see its infamous waterfall urinal. Women — sneak in when the coast is clear inside to take a look, too. It’s pretty entertaining to see! Don’t Forget to Pack: Layers; the weather in San Luis Obispo can be temperamental since it is warmer than the coast due to being inland a bit, yet still drops off cooly quite a bit at night. Carmel beach with views of Pebble Beach goal course. Carmel-by-the-Sea is a darling little city and will have you temporarily believing you’ve been transported to some ritzy European beach village on the Mediterranean thanks to quaint buildings framing ambling streets leading down to a wide, beachfront view of the ocean. From the beach you can also see famed golf course, Pebble Beach. Up above in the village, you’ll find gourmet dining, high-end shopping, art galleries and sweet cafes. I also love driving around outside the village to see the cute beach cottages that make up the nearby residential neighborhoods of Carmel. Top Attraction: The Village — take time to just walk around and explore its tiny streets and hidden courtyards. Where to Eat: Casanova — My sister-in-law had her wedding reception here, sadly before I met my husband! Luckily, he took me back to this French, garden-inspired restaurant and we feasted on an incredible meal. Where to Drink: Vino Napoli Wine Bar has an Italian vibe and good wine list. Where to Sleep: Tickle Pink Inn isn’t located right in the village, but looks pretty dreamy. It’s a goal of mine to stay there one of these years. 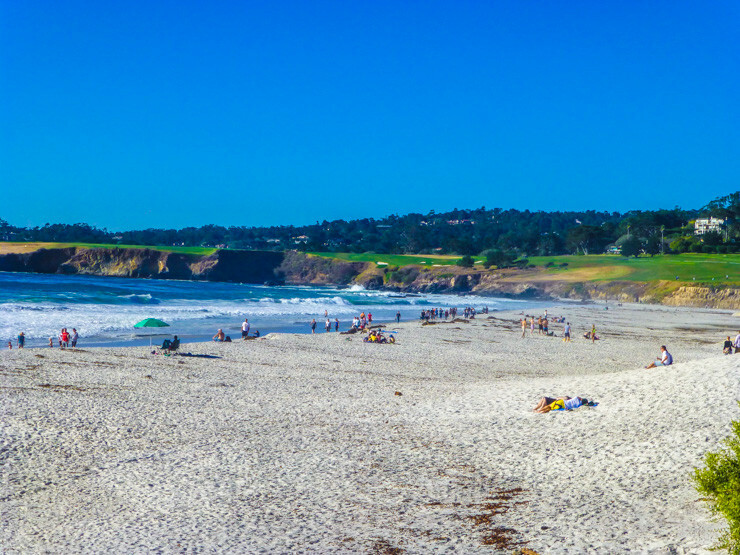 Insider Tip: If seeing Pebble Beach from the beach makes you want to visit, go for it. The public is welcome to walk around the clubhouse and non-course grounds, but you’ll have to make an (expensive) reservation if you want to hit some balls. Don’t Forget to Pack: A fashionable pair of sunglasses and nice outfit for a ritzy dinner experience. Fashionistas will like these sunglasses. Rock off the coast of Monterey with tons of seals lounging on it. Carmel and Monterey often go hand in hand since they’re right next to each other, but they’re actually quite different. While Carmel is tony and quaint, Monterey feels more expansive with sprawling coastline that is dotted with sparse shrubbery, soft sand, and massive rocks. The downtown area is historic thanks to the fishing industry that used to dominate Monterey, and which was made famous in John Steinbeck’s book, Cannery Row. You can visit Cannery Row still today, though now it’s home to restaurants and shops instead of sardine and other fish canneries. Monterey is also home to a the beloved Monterey Aquarium, which is a family-friendly activity that involves lots of sea creature viewing. Where to Eat: The Sardine Factory, which has several different fine dining rooms, each with a different ambiance. Where to Drink: Cannery Row Brewing Company if you’re a beer lover or Carmel Ridge Winery if you enjoy a good glass of Syrah or Chardonnay (and ocean views), both located along Cannery Row. Where to Sleep: Monterey has several luxury hotels lining the sea by Cannery Row. For where I stay, see the Insider Tip below. Insider Tip: Each time I’ve been in Monterey (and thus Carmel) I’ve stayed in Pacific Grove, a tiny city sandwiched between them on the tip of the Monterey Peninsula. Pacific Grove is missing some of the charm of the its two neighboring cities, but it still has gorgeous, rugged coastline, and is much more affordable. 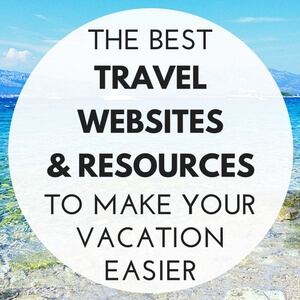 Choose your favorite Pacific Grove hotel here. 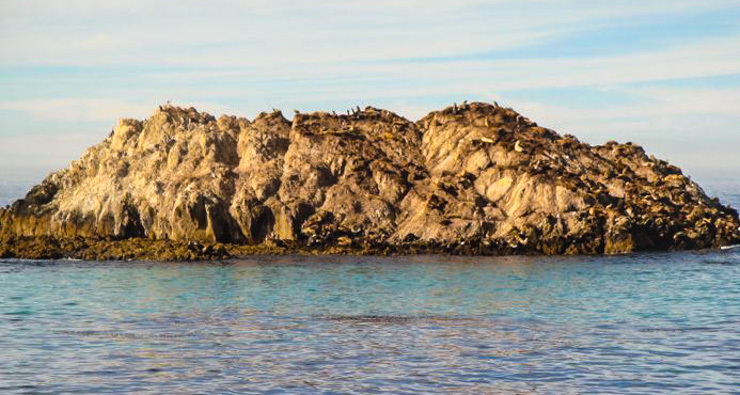 Don’t Forget to Pack: Sturdy sandals for navigating the rocks and binoculars for getting a better look at the seals frolicking in and around the sea and rocks. I love my Keens similar to this pair. It’s easy to just think of Napa as Napa Valley, home to vineyards and wine estates, but Napa is also a city and it’s worth spending some time in when visiting the region. The city of Napa is home to waterfront restaurants (thanks to the Napa River), gifts shops and boutiques, local history and science museums, a theater, opera house, conservatory, and (of course) many wine tasting rooms. Lining the city streets are lush trees framed by old brick and terracotta-colored buildings. 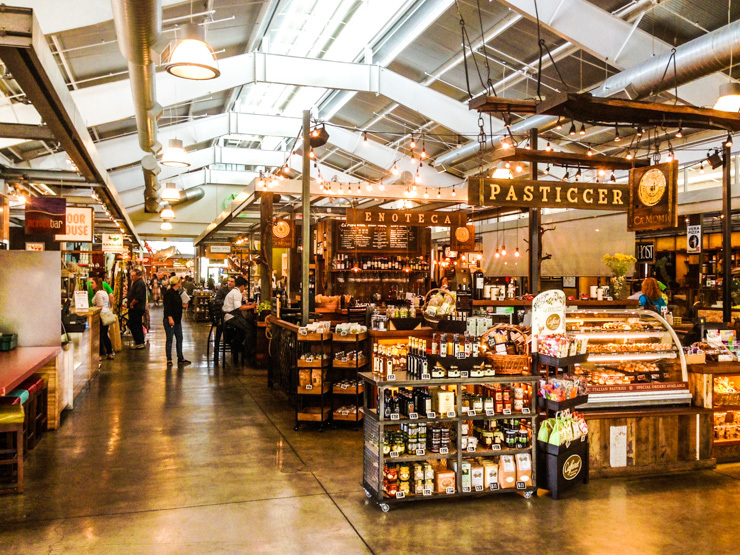 Top Attraction: Oxbow Market, a luxurious indoor farmer’s market that has artisan booths, wine tasting, and local food vendors serving ready-to-eat meals and whole vegetables and fruits. Where to Eat: Ristorante Allegria for some delicious Italian with local influences. 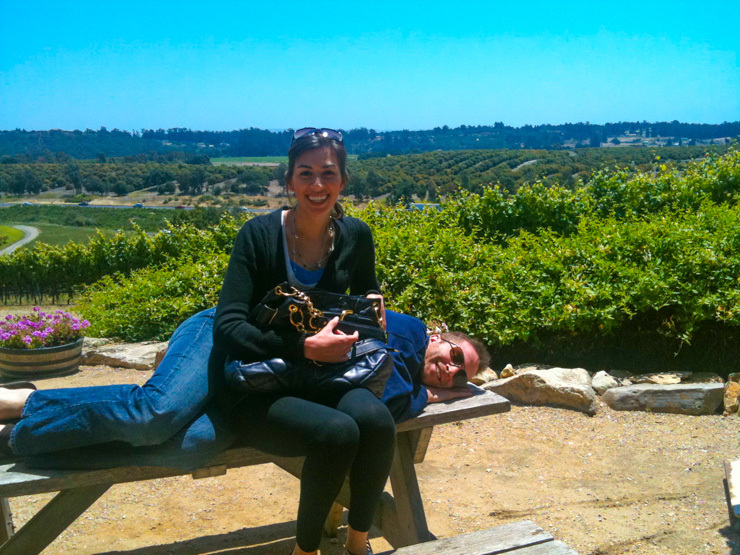 Where to Drink: You are in Napa, so drink the local wine! You can find a glass of it pretty much in every establishment in town. Where to Sleep: Napa River Inn at the Historic Napa Mill, which is located in a historic building and has river views, an onsite spa, dog-friendly rooms, and is easily walkable to most of downtown Napa’s sites. To see pictures and prices for Napa River Inn, click here. Insider Tip: Oxbow Market has an outdoor terrace overlooking the Napa River – bring a picnic or order from one of the Oxbow Market vendors and enjoy a waterfront meal for a fraction of the price of one of the river front restaurants in Napa. 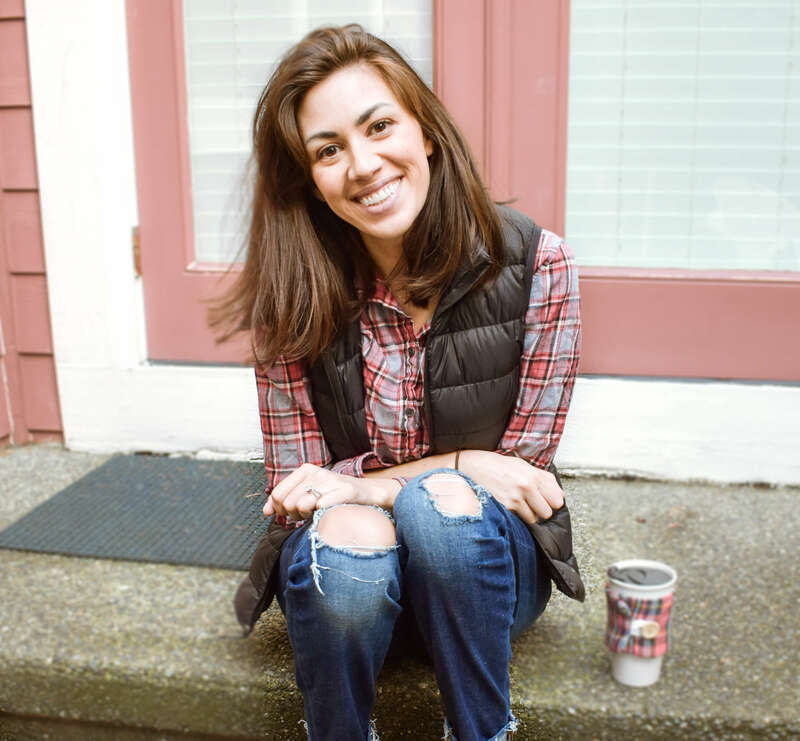 Don’t Forget to Pack: You’ll likely be doing quite a bit of walking and standing at wine tasting bars so ladies, wear cute and comfortable flats. I like this brand for comfort. Which of these small California cities do you most want to visit? I was anxiously hoping that you would list Pismo Beach. It’s between Solvang and SLO. It’s been a favorite for years, laid back community and the best clam chowder in NorCal – Splash Cafe! I second that! And add Temecula to your list too!! Good recommendation! I’ve had some great times in Temecula. Good to know — I’ll have to explore it more next time I’m in the area! I totally got teary-eyed going through this! It’s been a long time since I’ve been home! I practically grew up near Moonlight Beach! I’m from North County! North County San Diego is truly a wonderful place. Hope you make it back home again for a visit soon! When in Solvang, try some Danish Aebleskivers which are pancakes shaped like balls. You can even buy the special pans to make them. Thanks for the tip! Sounds delicious. Hey, Gina, outstanding list of top small cities in California! I have never been there but I want to visit such an amazing places. That’s a great Work You have done. Those are really sweet please. 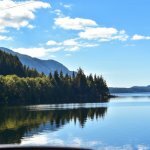 Great list of small cities! I am really glad to learn such content about California! By the way, Wishing you a very New Year 2017! We love our little beach town of San Clemente! Cute main street for shopping, pop down to the pier for coffee at Bear Coast and then finish the afternoon with wine, bites and live music at The Cellar! San Clemente is a cool town, too! Sounds like a fun way to spend a day there! You opened a totally new world for me, Gina! Some of these cities are on m y bucket list!